"Life must be lived amidst that which was made before. 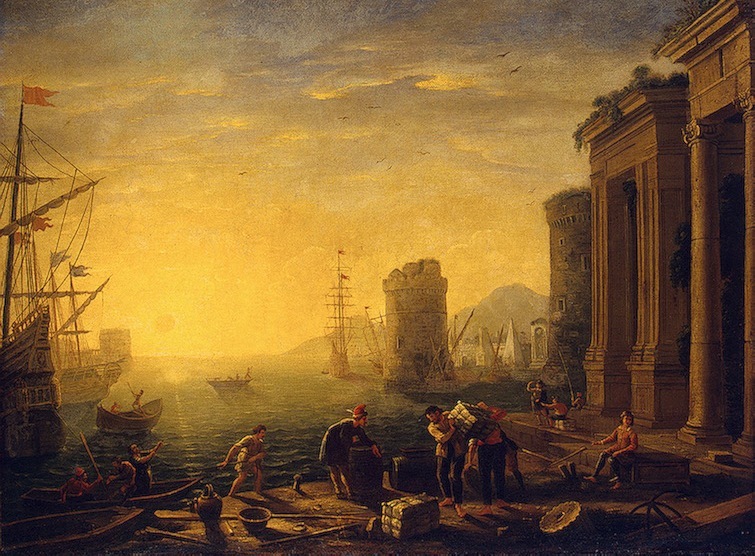 Claude Gelee (Lorraine) Morning in the Harbor, late 1630s, oil painting beside an aerial photograph of Istanbul [Constantinople "New Rome", Byzantium] J.V.S., 2014. "Every landscape is an accumulation. The past endures." Donald Meinig 1979, p. 44. "Landscape is not merely the world we see, it is a construction, a composition of that world. Landscape is a way of seeing the world." D. E. Cosgrove 1984, p. 13. 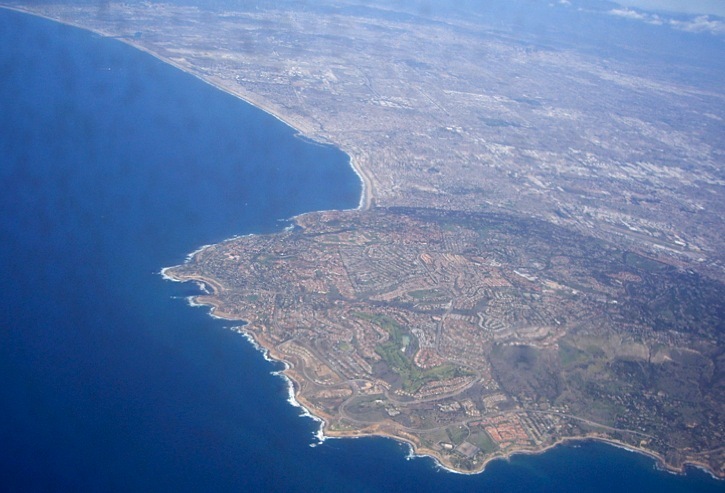 Palos Verdes Peninsula, looking north-northeast at the landscape of the west Los Angeles basin. JVS, 2006.
cumulative evidence of human adjustment to life on Earth." signs for decoding and analyzing our human use of the globe." those of function and intellect." 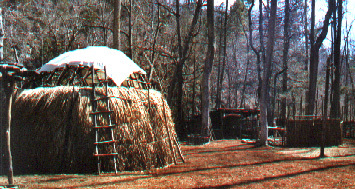 A reconstruction of an Eastern Woodland Indian community in Virginia's Blue Ridge mountains. Even many of the traditional items in our diet originated from this setting including corn, beans , squash, pumpkin, sassafras, turkey, fish, berries, and venison. Physical means the actual topography, hydrology, contours, and geography or natural features of settings, an evolving geology wherein biological evolution is manifest. 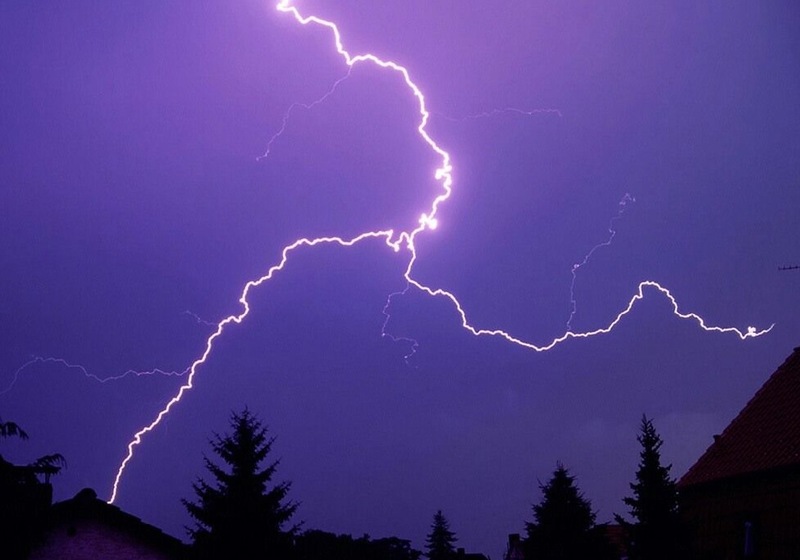 Affective is how surroundings (environs) are evocative or inhibiting, requiring a human response and thus the way in which a setting may act as an emotive influence on human character if not a determining element in the formation of our identity. Intellectual refers to how we discern cultural meaning from the layout of structures and buildings in relation to fields, forests, vegetation and natural features. How we explain the memorial quality of settings. 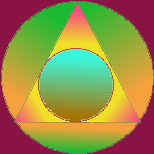 Relations among these three codependent spheres. Physical means a terrain's topographical, climatic, biological, & acoustical status. 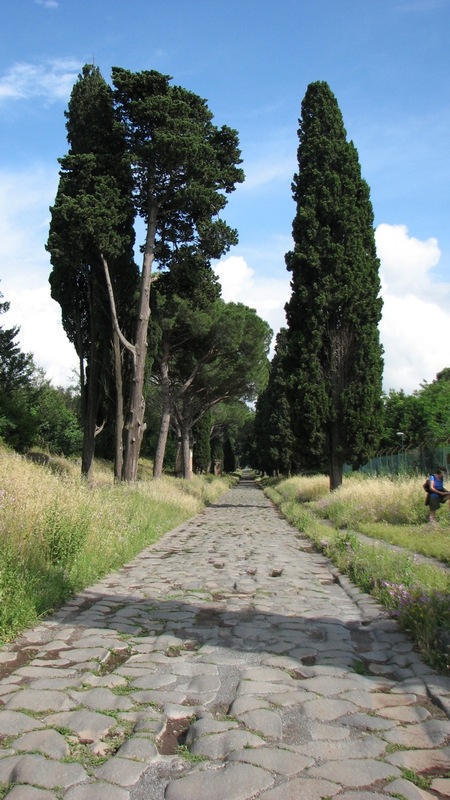 Intellectual refers to interpreting the place: Appian Way, Rome. Landskyp is the Dutch derivative of the German word landschaften referring to settled areas or inhabited places altered by human actions. 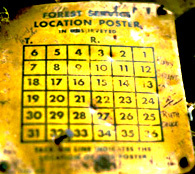 Cultural landscape is sometimes used to convey the transformation wrought by human economic relationships in any landscape's natural features, for example, forests. By turning trees into woodlands and orchards the transformation of the land gives rise to a particular configuration called a landscape. Thus the river is supplanted by the canal the prairie by a pasture and the shoreline by the embankment. 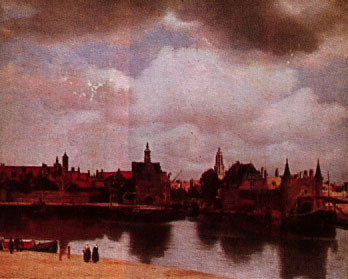 Landskyp is the Dutch word for "a representation of scenery" from the Netherlands and Italian 16th century painting wherein a view encompassing all the visible world is portrayed on the canvas by an artist. Dual character of landscape persists. Implied by paintings and landscape painting in particular is an objective world to view even by a subjective observer whose perspective of viewing a place is assumed to have been authoritative. 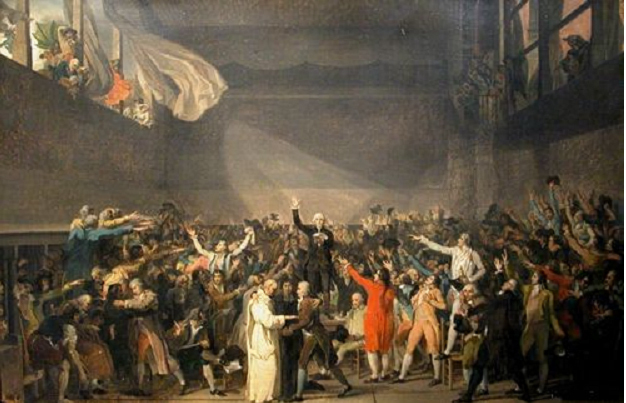 Such as here we see John Constable's a portrayal of Hampstead heath in England (above) and Jacques Louis David's depiction of the French Revolution's memorable scene (below) where the representatives of the republic swore "the tennis court oath." 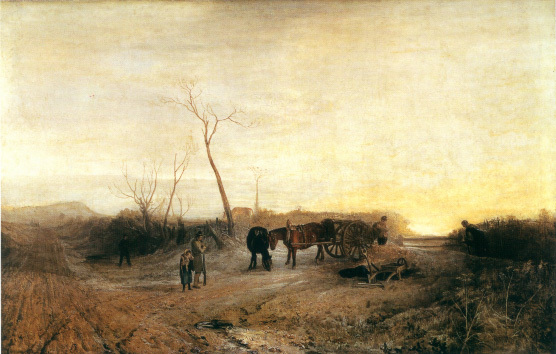 J. M. W. Turner, Frosty Morning. 2.A, There by natural means. 2.B, There my human (artificial) means. is expressed in his layout for the quadrangle at the University of Virginia. The plan is classical because it, among many other features, draws on the Pantheon as an inspiration for the rotunda pictured here. "Landscapes are commonly distinguished as natural or cultural. This is a useful distinction for historical purposes, but in practice few landscapes in economically advanced regions have escaped some degree of human modification." "The origin of the United State's land survey system has been associated with Thomas Jefferson, who chaired the committee in 1784 to prepare a plan for the government of the Western Territory." Hugh Williamson, NC had studied medicine in Utrecht suggested the land be divided by "parallels, dots and meridians." 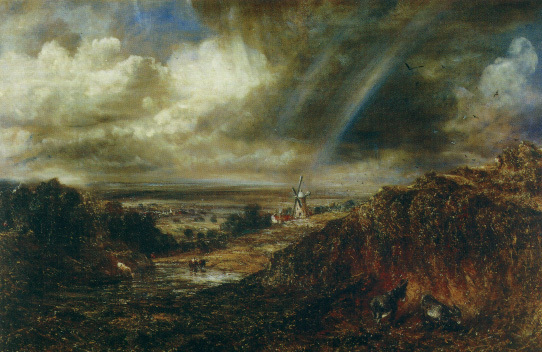 "He had seen rectangular field divisions of the Netherlands, some dating from the Roman era." 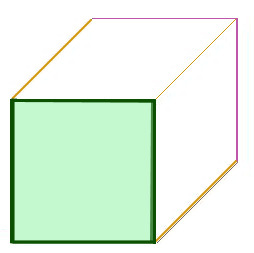 "The square has been used for land assignment worldwide since antiquity, particularly in colonized regions. 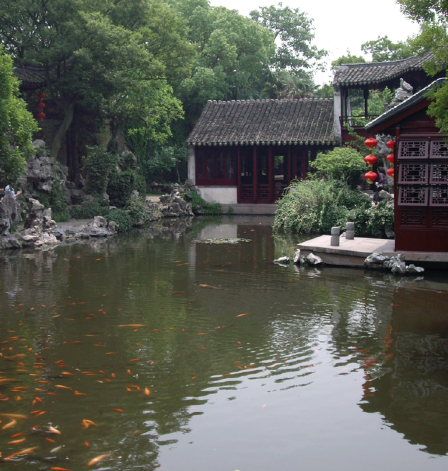 Mencius of China stipulated nine squares for eight families with a well in the central square. 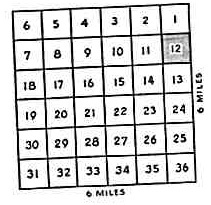 In 1638, New Haven was laid out as a square of nine blocks with a central green. The Japanese jori system has 36 cho in a square Ri, comparable to our township, but the coordinates are often tilted adjusting to topography." "Only the United States has a rectangular cadastral system with strict adherence to cardinal directions. 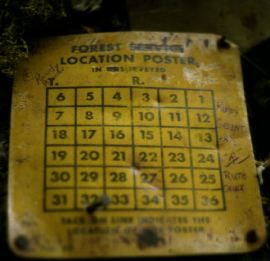 The coordinates were rarely tilted." The orderly disposal and settlement of the western lands Township and Range System. The orderly transfer of immense and largely unknown territory to private ownership Virginians argued to settle "along" natural lines -- but a square requires fewer measurements reduced from 100 to 36 squares township lines run N-S and range lines run E-W.
640 acres = 1 square mile following a tradition based on the surveyors chain of 100 links equally 66 feet widely used in New York and Massachusetts and invented by the English mathematician Edmund Gunter (1581-1626) where ten square chains make up an acre. 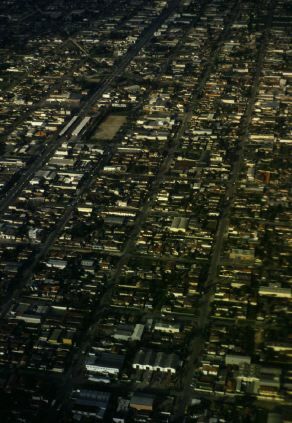 City blocks in America often = 5 acres and 2.5 acre lots are prevalent suburban – rural land owners. "This square world is humanly artificial, it is not a pattern rooted in nature. For all its economic simplicity, it is far from ecologically ideal. 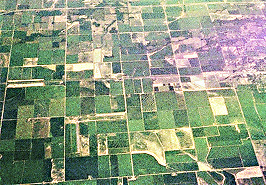 'Square agriculture on a round earth,' fulminated Hugh Hammond Bennett author of the USDA pamphlet, Soil erosion: a national menace, published in 1928 to a rousing nationwide reception." 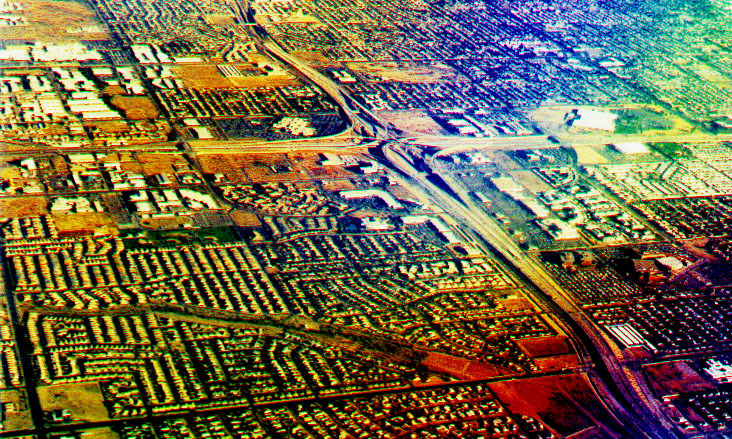 "The gridiron monotony of urban America is not entirely a consequence of the survey." unregulated, extremely wasteful of agricultural land and, in the desert, ecologically destructive." "The survey landscape is thought provoking rather than enjoyable. One thinks of its attributes: relentless sober and geometric, perhaps historical. 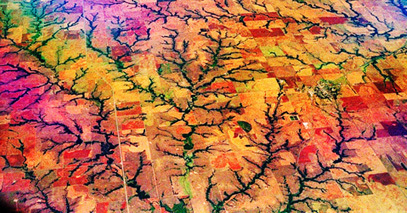 Every square mile is documented." J. B. Jackson finds the grid layout of the Northwest Territory 'the most imposing example' of the Great Awakening in the 18th century and considers the survey 'not an easy landscape to understand." "After all, the square has the quality of firmness, and the four elements, the seasons, the stages of human life, and especially the four points of the compass are all sources of order and the stability of the world." "There are several different approaches to landscape study current in writing on the American scene and they are worth distinguishing for they make the choice of content and arrangement of the chapters in this book more apparent." Donald Meinig, The Interpretation of Ordinary Landscapes. (New York: Oxford University Press, 1979), page. 44. Donald Meinig wrote in "the beholding eye" an essay describing ten views of settings or places based on the varied proclivities of the land's observers. He discerns "ten versions of the same scene" when ever we look deeply behind people's descriptions of landscape. locations that have esthetic draw, appealing to the senses, artistic sensitivity. "Ecology brings in the human element, for environmental awareness includes peoples' regard for their own relations with nature, and as such has attracted" wide interest across disciplines. "In Meinig's terms, nature, habitat, artifact, and system are all represented in landscape studied as a dimension of environmental awareness." "scientific awareness of the landscape is quickly matched by a subjective, judgmental dimension based on image, symbol, and representation." This leads to the recognition of a cultural landscape –terrains so altered by human settlement that the locations have significance above and beyond the material conditions of existence– for example: Chaco, Rome, Si'an, Jerusalem, Baghdad and London. 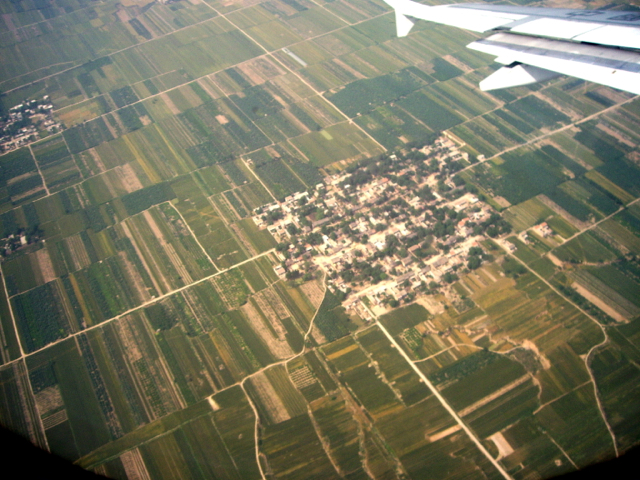 The north China plain between Beijing & Si'an, the ancient Sino heartland of the Hwang Ho, or Yellow River valley. Donald Meinig, The Interpretation of Ordinary Landscapes. (New York: Oxford University Press, 1979), page. 44, cited in "Introduction," The Making of the American Landscape, Michael Conzen, ed., (N.Y. Routledge, 1989). pp. 1, 3-4. The Making of the American Landscape, Michael Conzen, ed., (New York: Routledge, 1989).